This idyllic campsite right by the beach. Explore the island’s walkways, stunning coastline, replanted native bush and ever-increasing wildlife. Overlooking Home Bay, the campsite is near the Reid Homestead built in 1901. A stroll up through regenerating bush to the Northern Junction (via the Rotary Centennial Loop Track) and you can explore various WWII military remains including the battery which defended Auckland's harbour. The Home Bay campsite is divided into different areas called pods. Nest & Fledgings (10 tent sites) in the middle of the campground. Night Owls (6 tent sites) near the large pohutukawa tree. Sleepy Hollow (6 tent sites) adjacent to the northern Norski toilet. Early Birds (6 tent sites) at the northern end of the campground. Located on the east coast of Motutapu Island, in the Hauraki Gulf Marine Park. Rangitoto and Motutapu Islands are joined by a causeway. 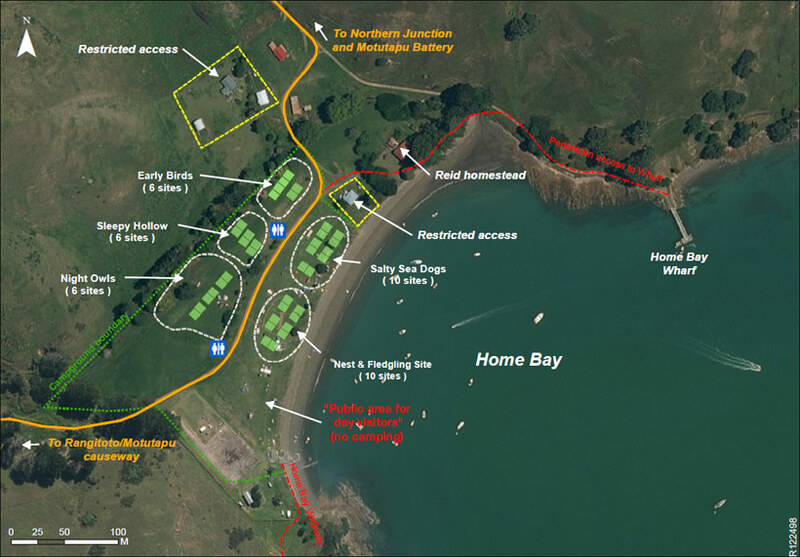 Home Bay Campsite is a 1 hour 30 minutes walk from Islington Bay Wharf, or aa 3 hour walk from Rangitoto Wharf via the walkway or farm road. Note: The topo map shows a "derelict jetty" at Home Bay. This jetty has been upgraded and is a fully functioning wharf. Check transport options for getting to Motutapu. Explore historic relics and the stunning coastline via the island's walkways, and enjoy water activities. Motutapu campsite does not provide wood barbeques, fireplaces, showers or picnic tables. No fires at any time. Gas cookers may be used. There is no power supply or light at this campsite. No generators allowed. Bring a torch. Water available. Water is treated and filtered but giardia may be present. For your health, boil drinking water for at least 3 minutes. There is no transport available on the island..